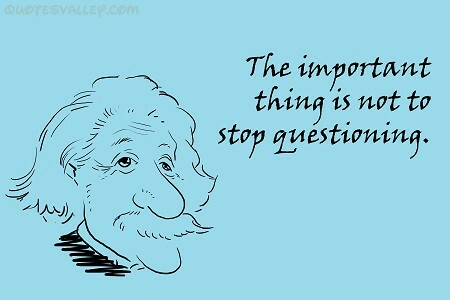 It’s also important to START questioning! After swimming laps yesterday at a local recreation center, I went into the steam room. Through the thick mist I saw two figures, both men, stretching and bending. I maneuvered between them and sat on the top tiled bench. As I took a few deep breaths while adjusting to the heat, I heard a deep rumbling sound that was a cross between Eastern monastic chanting and a plumbing problem. Was it one of the men, or the steam apparatus gone wonky? I couldn’t tell, based on where I was, their positions and the steam between us. Then, the sound stopped. One of the men, now seated below me, began moving again and the sound resumed, yet I didn’t see his mouth open or his diaphragm expand. Again, quiet. “Excuse me, were you chanting?” I asked, too curious to care about violating the customary silence. He was right. I wondered why I didn’t take advantage of the laid back attitude more often. The chanter resumed his deep, mysterious, resonant sound. I opened my mouth and added a much higher “aahm”. The two tones blended, creating an impromptu concert for a few minutes until he left. Next time, I might chant or sing if others are present. Perhaps I’ll even invite them to join me.